Wynn Palace is a big move for Wynn Resorts, but it's how the company handled the new resorts' table game limit that is its best move of the year. Restaurants will be a key revenue source at Wynn Palace, which isn't the normal course of business in Macau. Image source: Wynn Resorts. 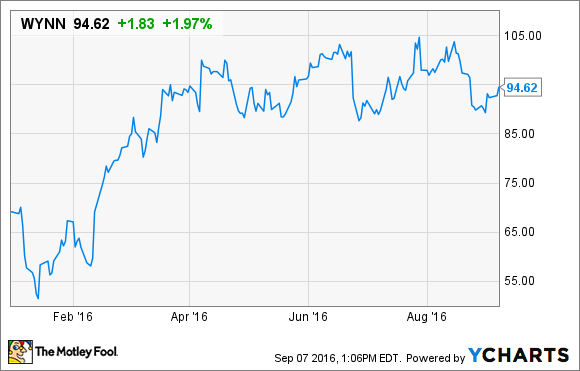 2016 has been a transitional year for Wynn Resorts (NASDAQ:WYNN). The company recently opened Wynn Palace in the Cotai region of Macau, which became the most expensive resort in Macau at $4.2 billion, and transformed the company's future. A decade from now, this resort might still be the most important property in the company's portfolio. On the market side, Wynn's stock has had a great run in 2016, helped by Macau's gaming market stabilizing and even a small amount of growth in August. But the best move so far came within the casino. One of the new realities in Macau is that table game growth will be limited for new properties. When Wynn Palace opened, it got just 100 new tables with another 25 coming at the beginning of 2017 and 2018, the same allocation Las Vegas Sands got at The Parisian. Tulips sculpture by Jeff Koons in Wynn Palace. Image source: Wynn Resorts. Since 100 table games isn't enough to make a $4.2 billion resort profitable, Wynn Resorts had to adjust. It did so by moving 250 tables from Wynn Macau to Wynn Palace. That leaves 270 tables at Wynn Macau and 350 at the new Wynn Palace. I would expect Las Vegas Sands to do something similar when The Parisian opens. This could affect how much revenue Wynn Resorts can generate in Macau, but Wynn thinks it can adapt. The company is focusing on customers from the high end of the mass market and a small number of VIP rooms in Wynn Palace, maximizing profits -- not just revenue. And since tables aren't completely full 24 hours per day, the missed revenue can be minimized to some extent by focusing on high-margin customers. You can look at the limited number of table games as a way to push Wynn Resorts to focus on the right customers. Essentially, it's "firing" low-margin customers, particularly in the VIP market, by not giving them perks and focusing attention on customers that really make the resort money. And the hope in the new resort is that those customers will spend more money on hotel rooms, restaurants, and shopping than they ever have before. The moves Wynn Resorts made in shifting tables to Wynn Palace and focusing on more profitable customers are the right things to do, but they're still a risk. The reality is that limiting table games potentially limits revenue for gaming companies. Wynn Palace also needs to prove that it can get customers to spend a significant amount of money off the casino floor. Wynn Las Vegas gets about two-thirds of its revenue outside of the casino, so we know the company can do it. Now, customers in China will have to prove they're willing to make that adjustment as well. If anyone can make the adjustments needed to make Wynn Palace profitable with limited tables, it's Steve Wynn. This is a stock worth watching as we move forward in 2016.